Hi! My copy just arrived can't wait to play however some of my timers look egregiously wrong. What should the times be on my big vs small timers? I quickly skimmed the rulebook but didn't want to mess around too much in case I need to send it back. Time them. They may look different but they are supposed to be around 28-32 seconds. Mine look quite different but they are all roughly equivalent. Unfortunately some of them stop running during the game. Have to keep an eye on a specific few so you don’t miss it during a round. May have to source my own timers! Check them as the above person mentioned as long as it is between 27-32 secs its fine. If you have any other issues like them getting stuck or way too from the time mentioned, email Arpitia, they will send replacements. I just tested my timers and I'm aghast at the terrible quality control for what is the central component of this game. I have timers going from 25 seconds (which got stuck once or twice) to 36 seconds. The ones that are 36 seconds even flip between 28/35 and 31/36 seconds when you turn them over, so they're not even consistently off! This is the most ridiculous screw-up I can think of. It's like selling a dice game with loaded dice. Off to contact them for replacements, I guess. Visually, all of the timers look different with regards to how much sand is inside them. That being said, for the most part they are all within 1-3 seconds of each other. Except for one of the green ones which seems to be an additional 3-5 seconds slower than all of the others, but I need to do some more testing to confirm. Please note that the amount of sand and the design of the hourglasses is irrelevant with their actual duration. 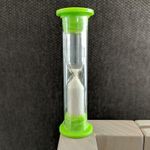 If you have hourglasses that last less than 25 or more than 35 seconds (accepatble range that does not affect gameplay) then let us know which ones are to arrange replacement shipment. LOL, geez, a range of 25-35 does not affect gameplay? Really? I don't think so. So if you have one timer at 25 and the other timer takes 10 more seconds each action to finish, it doesn't affect gameplay? Every person who works in a kitchen has different abilities, therefore, the time that every worker needs to prepare a dish is different. As the hourglasses do not deviate more than five or six seconds form the 30 seconds' time, I don't consider it as a manufacturing fault, but as a nice thematic element itself! It's within the time range but very hard to see that it finished. Artipia said they would replace it. If it bothers you, make your round timer 4 minutes 20 seconds. That should cover the slow timer without giving an advantage to the fast ones. Cheap sand timers are imprecise, I doubt replacements will be more reliable. There is a reason we don't have hour-glasses strapped to our wrists. All mine are within 2 seconds of the 30 second target except for a blue one that is 24 seconds and a yellow one that is 42 seconds. We have one that lasts 19 seconds and one 90 seconds. The rest is 29-33 seconds. I backed this game with the expansion and played it for the first time today. 2 of the colours lasts about 120 seconds. That's crazy. I hope they will replace the hourglasses. I mailed them the moment I replied here and got a reply back an hour ago. They will replace them. Top service!